information about my on-line classes and special sales. As you view my designs or have a question please feel free to contact me. Sharing information is important, always. I continue to teach here in my studio from September thru June. I take up to eight students and it is truly Studio Time where each person brings either a painted canvas, a class piece or wants to work on one of my designs. Embroidery and canvas. I help with it all. Ideas, ideas. The class is $20.00 beginning at 12:30pm until 3:00. If you need threads then you may come at 12:00. Marnie has been a teacher, lecturer, judge and designer of the art form known as Embroidery for over thirty years. Embroidery techniques advocated by her teaching skills encompass the areas of Silk, Metal Thread, Crewel Embroidery, Surface Stitches, Canvas Embroidery, Embroidery Embellishment and related techniques all combined to create pieces of needleart. Marnie's forte is to continuously discover new and innovative techniques combining the above mentioned embroidery skills which she cheerfully shares with her students in an enthusiastic manner. 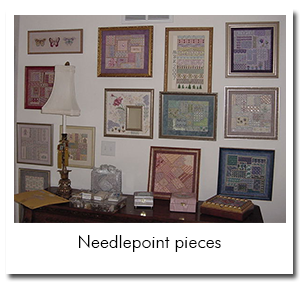 Over the years Marnie has taught across the country for guilds and seminars sponsored by the Embroiderers' Guild of America, The American Needlework Guild, The Council of Embroiderers, Callaway Gardens and many others. 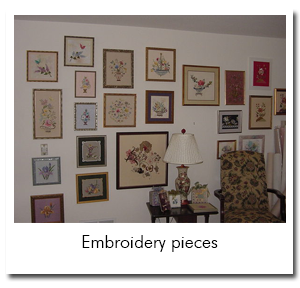 Marnie has her Teacher's Certification from The Council of Embroiderers in Surface Stitchery and was awarded the Lifetime Achievement Award from the National Academy of Needlearts in 2006. Each year since 1978 Needlepoint Plus has featured one of Marnie's designs for their Spring issue cover story thru 1995. Needlepoint Now is now the source of her articles. In 1990-91 Marnie was the Co-Host for the public television series "The Needle Workshop" produced in a joint venture with the Embroiderers' Guild of America, Inc. and WKPC-TV, Louisville, Kentucky. 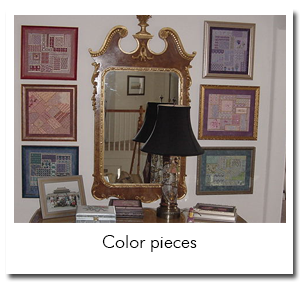 She authored "Marnie Ritter's Canvas Patterns" Book l & 11 and "Embroidery My Way" in 1992, '93 and '94. The third Canvas Pattern book is now available. She has served as the President of the Colorado Chapter of EGA from 1995 to 1997 and is the again past president for 2001/2002. Come join one of her classes! 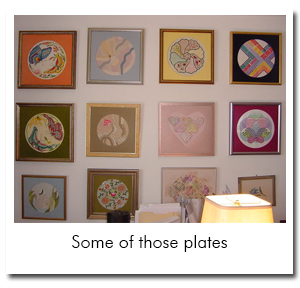 We hope you enjoy looking at the photos of some of the pieces from Marnie's home. How many have you done?